Jujitsu translates to "the gentle arts" and is the ancient empty handed fighting form of the Japanese Samurai. It was originally designed to be used on the battlefield against armed enemies. Due to the heavy armor of the samurai, striking techniques were ineffective, so they relied on the bone crushing throws, grappling controls and submission techniques to get the advantage on their enemy. Arts such as Aikido, Aiki-jujitsu, Small Circle Jujitsu, Brazilian Jujitsu and the sport of Judo all originated from Samurai Jujitsu. The Jujitsu practiced at Peaceful Warrior is a blend of the stand up self-defense techniques of Aikido, Aiki-Jujitsu and Small Circle Jujitsu, the throwing techniques of Judo and the grappling techniques of Brazilian Jujitsu. We keep the traditional ideals of the Samurai art alive while allowing our art to evolve so that it can be used in modern day threats. Students learn to protect themselves in any situation, standing up or on the ground. Jigoro Kano was born in 1860. As a child he went to Japanese-English boarding school in Shiba, Tokyo. During the time there was savvier bullying problem at school, which ultimately lead Kano to seek out a Jujitsu teacher. Due to the fall of theTokugawa Shogunate in the Meiji Restoration of 1868, jujutsu had become unfashionable in Japan. This made it extremely difficult for Kano to find a Jujitsu instructor. 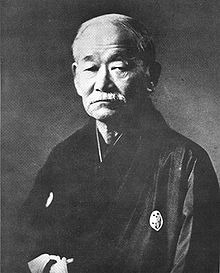 His first teacher was Fukuda Hachinosuke of Tenjin Shin Yo-Ryu Jujitsu. Fukuda taught techniques over formal exercize which would later influence the judo version of Randori. Fukuda died in 1880 leaving kano teacherless once again. Kano decided to persure another Tenjin Shi Yo-Ryu Jujitsu school and started training with Iso Masatomo who put more imphases on practicing technique rather then fighting in Randori. In 1881 Iso also passed which lead Kano to train in Kito-Ryu Jujitsu under Likubo Tsunetoshi. Kito-Ryu Jujitsu used more nage-waza or throwing techniques. In 1882 Kano founded his dojo, which would later be called the kodokan. Eventually Kano decided that he did not want to call his art by the name Jujitsu so he changed the character and started calling his style Judo. Today Judo is a popular sport worldwide and can be found as a sport in the Olympic Competitions. 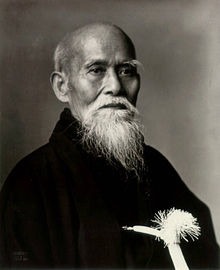 Morihei Ueshiba was born in December of 1883. He started training in martial arts at a young age however he was not very focused towards any one martial art and his training was not very specific. As a young boy he was considered to be sick, small and weak so his father encouraged him to take sumo classes and swim to build up strength. Ueishiba was known to have trained in several martial arts including Tenjin Shin Yo-Ryu Jujitsu and Judo. However his real training began when he started training in Daito-Ryu Aiki-Jujitsu, also know as Daito-Ryu Jujitsu, under Takeda Sokaku. Ueshiba began teaching in the early 1920’s. In the early years of his teaching he used many types of weapons, vital point strikes, throws and joint locks. As he became older an more refined he began to call his style of martail arts by different names and ultimatly settle with the name Aikido. 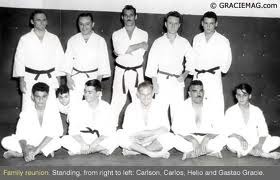 The Gracie Family have been some of the most influential people in the popularization of jujitsu worldwide. The Gracie family began training jujitsu in 1917 under a Japanese Judo practitioner named Mitsuyou Maeda. From there they ultimatly developed there own style called Brazilian Jui-Jitsu also know as BJJ. They have repetedly tested and proven there style of sport fighting in extream fighting arenas. As their number of victories grew so did the popularity of jujitsu spacifically BJJ. Three time UFC winner Royce Gracie to there newest champion Roger Gracie the family has developed and proven a superior methode of ground fighting.